And I’m over it. Done. I’m fine with no Halloween this year – seriously. Nothing…except memories. The closest I’m coming to celebrating Halloween this year is driving by a pumpkin patch on the freeway and viewing other people’s costumes on social media. Yes, I’m that pathetic. I’m an empty nester, you know – and just absolutely cannot bring myself to put out the decorations this year. First of all, Halloween is on a weekday. I’m too old for costume parties. I’ve got papers to grade. The dog goes crazy. I’ll get PLENTY of festivity teaching 7th graders in costume. There are no kids at home this year to celebrate, AND each Oct. 31 we’re lucky if we get two rings at the doorbell. I’m over it, big time. I bought pumpkins at Trader Joe’s, but won’t carve them. I got a vanilla-pumpkin scented candle but haven’t lit it. At Target I bought a few bags of candy – just in case – and already opened them. This Halloween I’ll probably just stay home, in the farthest corner of my house, and think about when Halloween used to be fun. I can have my own empty-nest pity party for one, yes I can. My mom used to make our costumes, or we’d piece together some sort of get up out of closets, dig into her makeup drawer and call it good. My sister, the creative one, somehow managed to pull together the MOST amazing costumes for all FIVE of her kids – she sewed them herself and stole the show at the downtown trick or treat. Our kids trudged around town in the afternoon heat, ending up sweaty, sticky and ready to be done before dark. Oh yes, those were the days. Last weekend Lily and I spied a little girl, maybe around two, wearing a Minnie Mouse costume. She dropped her ears as she stepped out of the elevator we were on, and as I reached down to hand them to her, I noticed her shiny red shoes. Memories streamed back to when two-year-old Lily was obsessed with her shiny red boots. 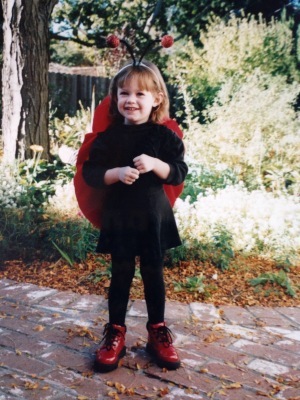 My sister created the most adorable ladybug costume for her, complete with a backpack-type red and black spotted ladybug shell that slipped over her shoulders, and a little bouncy antennae headband. But it really was the shiny red shoes that put it over the top. When I asked Lily if she remembered it, she said no. Of course, she didn’t. So why is it so ingrained in my mind after twenty years? I guess Halloween is over-rated, even in my memory bank. I dressed him up as a red chili pepper for his first Halloween. 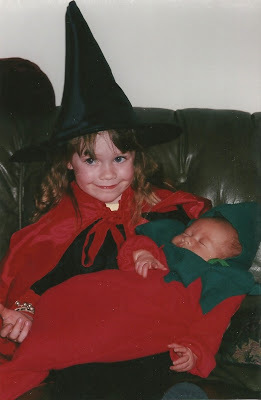 His tiny three-week-old 6-pound little body zipped snugly into the red and green fleece, making it simple for his three-year-old witch sister to proudly snuggle him on the couch before we went out. I think we made it around the block that year; mostly, I remember feeling so proud to have two healthy babies to parade around the neighborhood. Maybe the chili pepper was a foreshadowing of things to come – Cam’s obsession with hot sauce just led him to research his favorite brand for his entrepreneurial class in college. We went through Dorothy, Bob the Builder, cross-dressing, pirates, Pocohantas and whatever else their imaginations could conjure up. A phase of presidents and presidential candidates always brought laughs when the doors opened, even into the teenage years. I think I’m OK with no Halloween this year. I’ll smile as my students come dressed up for school, and then slowly bike home before dusk. I don’t think I can handle the cuteness this year. I don’t think I can watch Charlie Brown. I’m sure I just need to lay low, be quiet. I know I can’t handle the memories right now, either. Maybe next year. Halloween is over-rated anyway, isn’t it? But I’m still not decorating or answering my doorbell.